While the tub, shower and vanity cabinets tend to get all the props for making a bathroom great, the functional practicality of mirrors and lighting can't be overlooked. 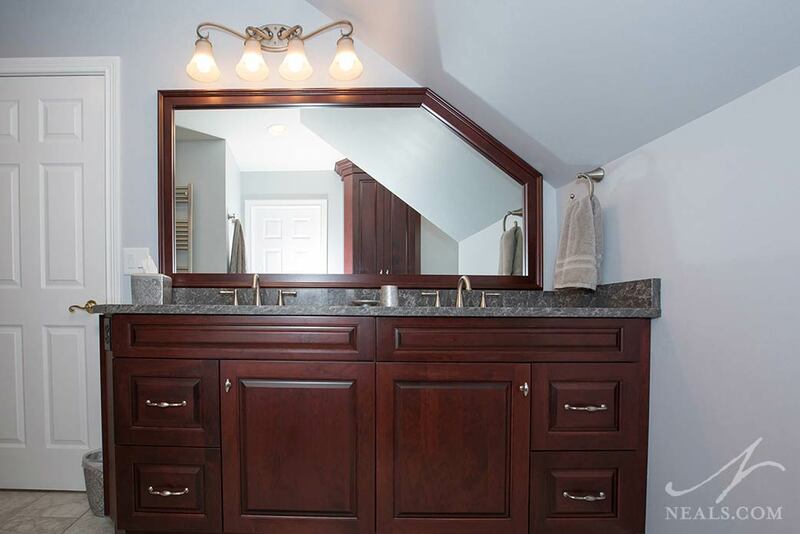 Here are 6 things to look for when deciding on the mirrors and lights for your bathroom vanity. 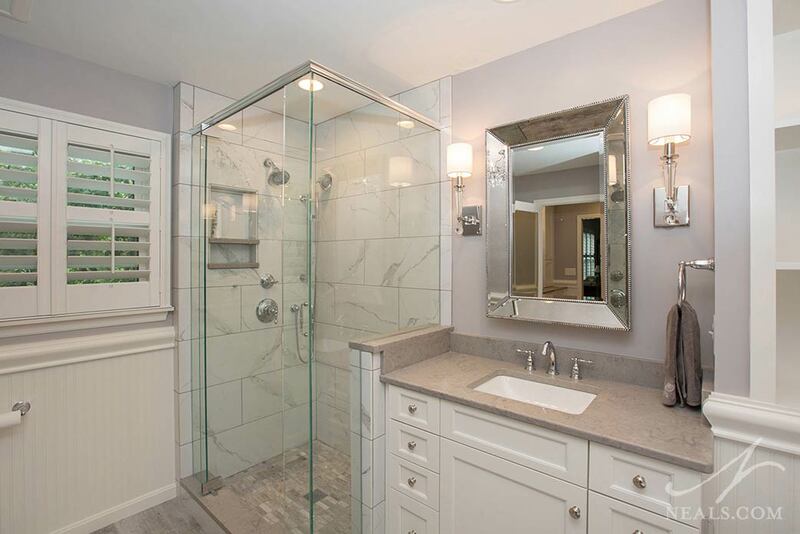 Large-scale mirror in this West Chester bathroom. When it comes to mirrors for the bathroom, you'll have several choices for how large or small you want to go, but here are some things to bear in mind. If you share the sink with someone else while getting ready, a larger mirror that accommodates you both will prevent awkward "mirror time" battles. In that same vein, take into account any height differences. A mirror placed at a comfortable height for one person may be too low or high for another. Being able to see most of your upper body or just wanting to focus on your head will also impact the scale you require. Also think about what happens when you stand away from the sink and whether seeing yourself from all over the room is helpful or horrifying. 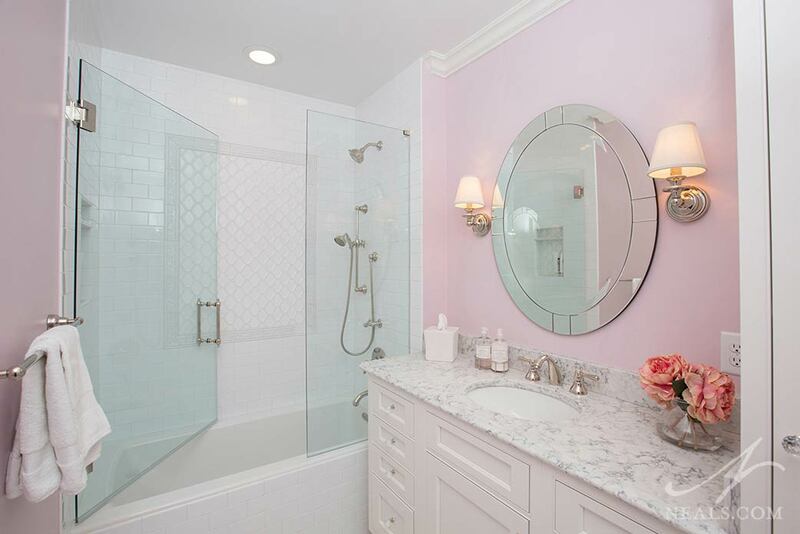 Round mirror in this feminine bathroom in Indian Hill. 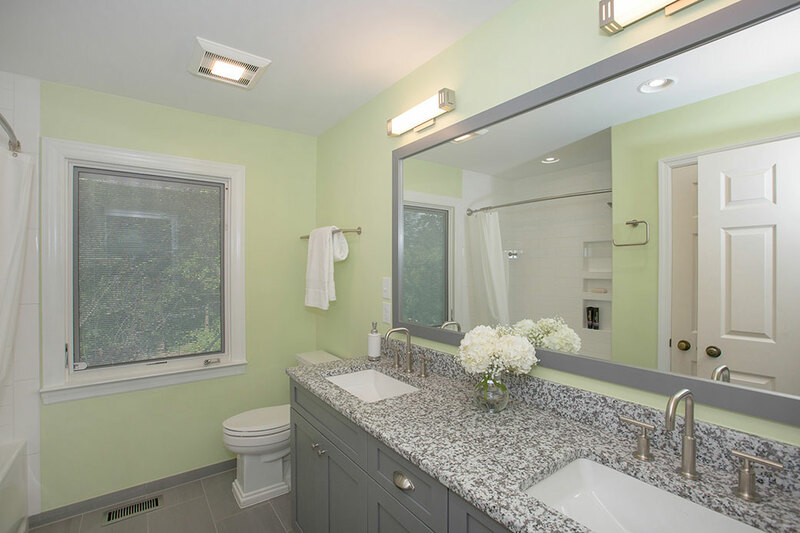 While a standard rectangular mirror is a great, functional choice for any bathroom, there are many other options on the market. A circular mirror can create some interest against all the straight lines that make up a bathroom, and are usually going to make a strong style statement. A square mirror, if it works size-wise, can be a good option if squares dominate the bathroom already. You may even consider a long, narrow mirror hung horizontally across a double vanity. Custom mirror shaped to work around the angle'd ceiling in this Montgomery bathroom. When you're going through a full bathroom remodel, you'll have a opportunity to include the mirrors as part of your custom solution. The advantage of a custom mirror is that you will get the size and shape you need, and it can be made to seamlessly blend in with your new cabinetry. You also have the chance to create a mirror that works with any unique architectural situations in your bathroom. There are, however, many different pre-made mirrors in a huge selection of styles and price points. If you're looking for something that stands out, adds style, or includes storage or lighting, a pre-made mirror might be the way to go. 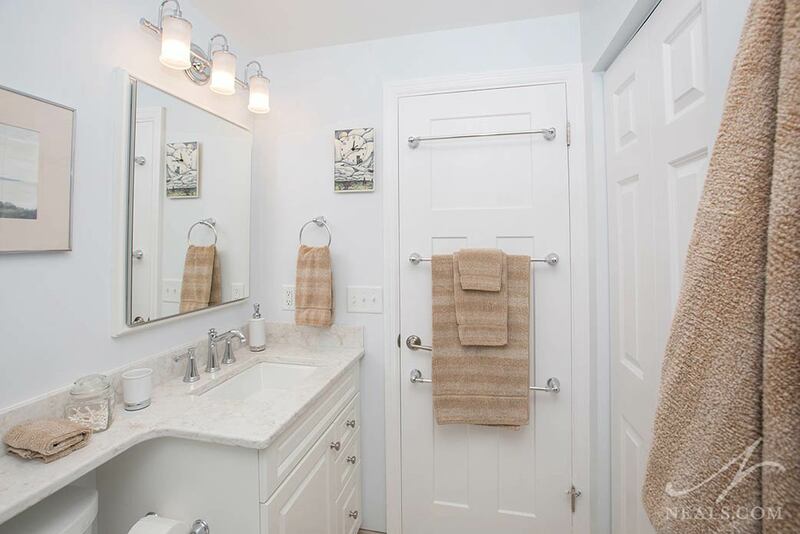 Three-bulb vanity light fixture in this Deer Park bathroom. Vanity lighting is an entire category of lighting fixtures specifically created to hang over mirrors. In many homes, this is often dressing room style lighting that may often be too bright for most people (or generate too much heat while on), but there are many other stylish options. Vanity lighting is one area in which your style can be easily conveyed, whether it's traditional, contemporary, or somewhere in between. Vanity lighting is ideal as it's designed to direct task lighting toward you, illuminating your face from the top in an even wash of light that doesn't create harsh shadows anywhere. 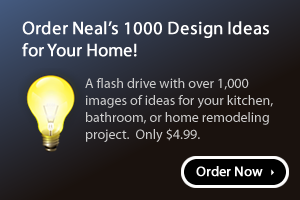 They often come in panels with multiple bulbs - 3, 4 or 5 bulbs are most common, so they can also easily illuminate a small-scale bathroom on their own when you don't need the lighting in the shower or commode areas. Sconce lighting in this Indian Hill bathroom. Sconces are single light fixtures attached to the wall, typically on either side of the mirror. 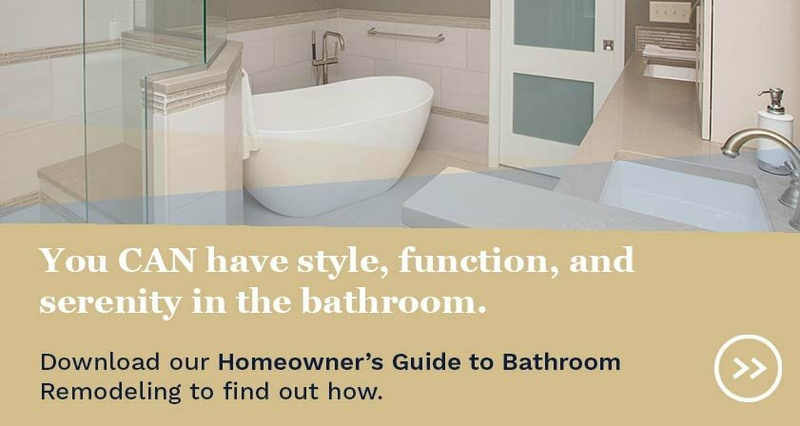 While there are many types and styles of sconces, it's important to look for fixtures that are ideal for a bathroom setting, as opposed to somewhere like a bedside or hallway. If they will be providing your task lighting at the vanity, the illumination needs to be general, rather than directed up or down. Sconces will direct light to your face from the sides, which will, in most cases, be enough to light you properly, but if the sconce isn't bright enough, you may find that an additional light (perhaps in the mirror itself) will be needed. 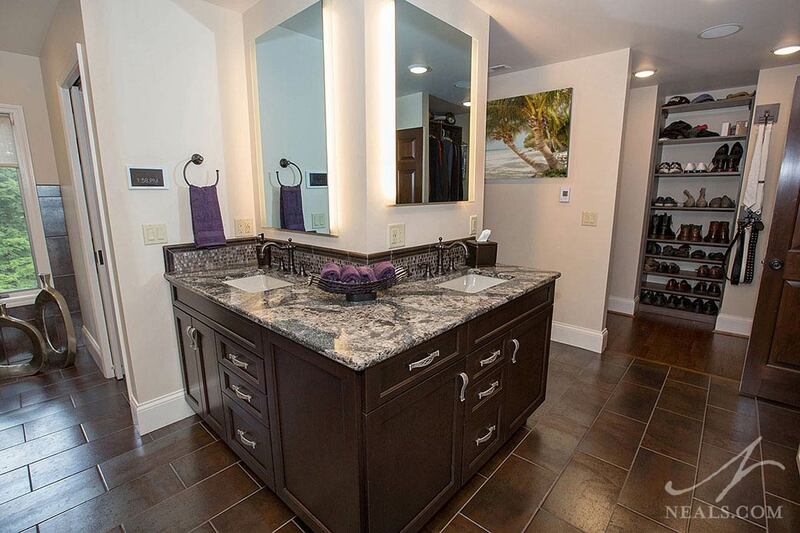 These light-up mirrors also have an embedded TV screen in this Indian Hill bathroom. There are also mirrors on the market that can offer a solution for both your reflection and your task lighting. With a simple switch, the mirror can provide light around it's edge, illuminating you fully. Mirrors that are wired into smart home systems can display an embedded TV screen, which is a great feature when you want to watch your favorite show, but don't want the eyesore of a TV in your bathroom.